Make the most of your first impression with a handmade pen or writing instrument. Do first impressions count? Yes, they do! 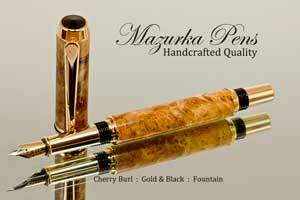 A quality handmade pen can help you make that good first impression. Each pen is a work of art. The highest quality materials are used when making a pen. Each is guaranteed to make a great impression on you and those around you. Looking for that perfect gift for someone special? Maybe a colleague or boss? Make an impact by giving a custom handmade pen as a gift. We have fast shipping and great customer service. You can read reviews of what our customers say about us. Our quality pens are made to exacting standards. Our goal is to make the best pens, not the most. Our selection of pens is diverse and unique. We use interesting and vibrant materials that make your pen shine. Each of our handmade pens is turned by hand in our shop. We keep many styles of rollerball pens and fountain pens in stock. 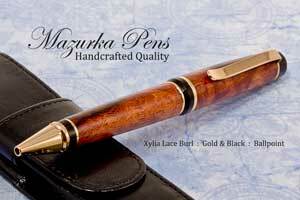 Feel free to look through our inventory of handcrafted pens or visit Our Gallery of previously sold pens. If you have something particular in mind, but don't see it, please contact us and we will be please to make it custom for you. 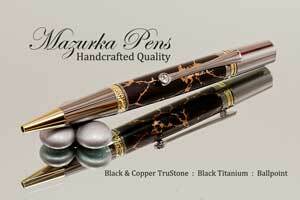 We carry a large selection of handmade Ballpoint Pens, Rollerball Pens and Fountain Pens along with pen accessories. To compliment your pen, we carry wooden pen boxes, pen cases, ink refills and other unique gift items and accessories. We have many styles, including single-bodied, dual-bodied and cap-based pens. We are certain that you will find a style that you will like or a special gift idea that you can give for any occasion. Each of our pens is handmade in our shop. We don't outsource any production overseas. All of our products are made by our artist. Each pen is made from the best materials from around the world. Whether it is an wood pen made from domestic or exotic species, a TruStone pen, acrylic, polymer clay, or antler pen, you can rest assured that we have carefully hand selected the materials to ensure you a quality product. Each pen is hand finished, with multiple layers of hand-rubbed finish to ensure a deep, rich look that will last. All of our pens are hand-assembled and hand-polished for a showroom finish. 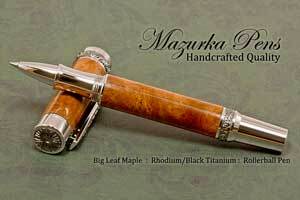 Make a statement with a handcrafted pen from Mazurka Pens.